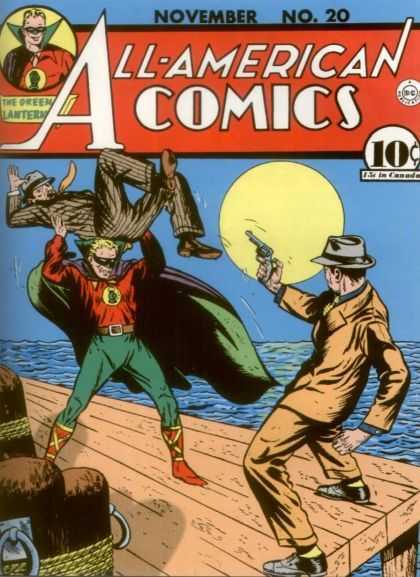 While Abigail Mathilda “Ma” Hunkel isn’t the first crossdressing superhero in comics (that distinction goes to Madam Fatal, a man who dresses as an elderly lady to fight crime), she is the first superheroine to dress as a man. As a large, tough as nails, hardworking mother of two, Ma Hunkel is a very different kind of superheroine than is typically depicted in comics. 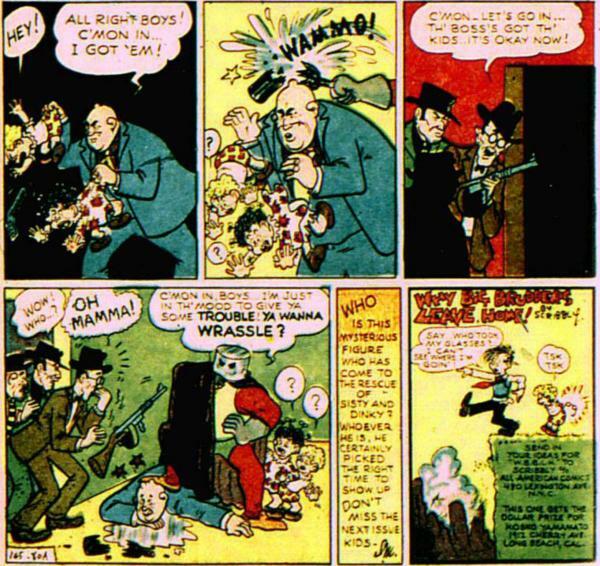 Created by Sheldon Mayer, Ma Hunkel first appeared in the pages of All-American Comics #3 (June 1939) in a feature entitled Scribbly. More than a year after her debut, she would create her Red Tornado persona in All-American Comics #20 (November 1940). After Ma acquires ownership of a local grocery store (yes, this mom is also a small business owner), a couple of racketeers try to shake her down for protection money. Being that she’s Ma Hunkel, she kicks their asses rather than paying them. The beaten men flee the scene in such a hurry that no one notices that Ma’s young daughter Sisty and her friend Dinky have managed to lock themselves in the men’s car. When Ma realizes what has happened, she demands that the police arrest the men and their boss, Tubbs Torponi. 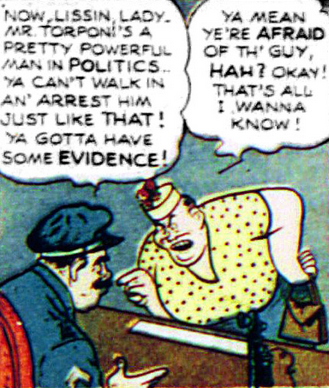 As it turns out, Torponi is a powerful man and one the police are unwilling to go after. After hearing her son Huey and his friend (the title character “Scribbly”) gush about how the Green Lantern (Alan Scott) would be able to save the girls, Ma decides to take matters into her own hands. Donning a cape, a pair of long johns, and a cooking pot to wear on her head, Ma creates the identity of the Red Tornado, makes short work of the thugs (with help from the girls), and saves the day. 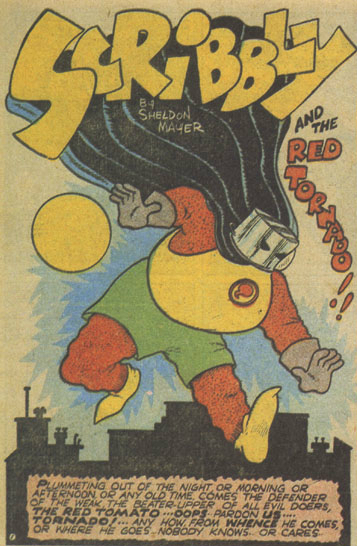 Scribbly is a funny book in the most literal sense of word and the Red Tornado is largely a superhero parody. However, that doesn’t change the fact that she is a total badass. Sure, she has a penchant for tearing her trousers on window ledges and she’s got a pot on her head, but the Red Tornado not only fights in a spandex world dominated by men, she does so while flying in the face of the typical representations of female comic book characters. Stay tuned for the final installment of the Women’s History Month Superheroine Spotlight series for a look at Wonder Woman, the most influential superheroine in comic history! WAHT?! 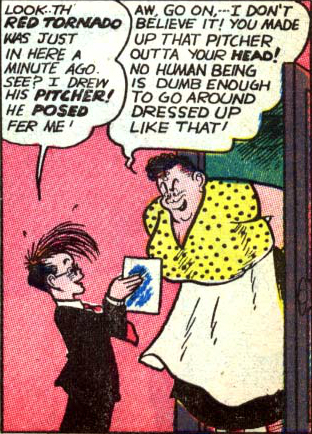 Wow, I’m actually surprised to learn the first cross-dresser superhero is surpassing Disney comics. Usually they’re the first at EVERYTHING! DAMN, now i have to rethink my life.